Hi friends....Lets see how to make the perfect whole chicken roast on stove top. No baking, no time for marination, less time consuming recipe...The result is the best whole chicken roast ever..tastes heavenly.. I was planning to make the exotic dish of Malabar (region of Kerala, South India). 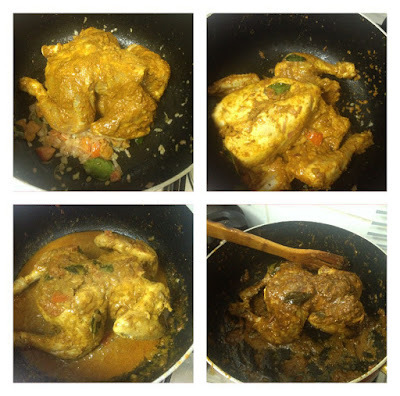 That is Stuffed chicken or Kozhi nirachath. It is the popular dish among muslims in malabar region and they used to prepare it in special occasions like Eid, Iftar etc. I had marked to try the recipe of whole chicken for a long time. And i simply googled for the recipe and unfortunately stuck with another whole chicken recipe. Its WHOLE CHICKEN ROASTED ON STOVE TOP. Normally for most of the whole chicken recipes, baking is preferred as the method of cooking rather than cooking on stove top. But don't worry,,,, ,on my guarantee.....do it on stove top....it really works out very very well...really yummy and toothsome. The inspiration behind this roasted chicken recipe is Aarthis (Yummy tummy) blog's recipe. I fell in love with her pic of roasted whole chicken on my first sight itself. But feel disappointed and sad as it took more time for marination and baking. So i thought of cooking the same with my own method. But the recipe for marination, the same only. 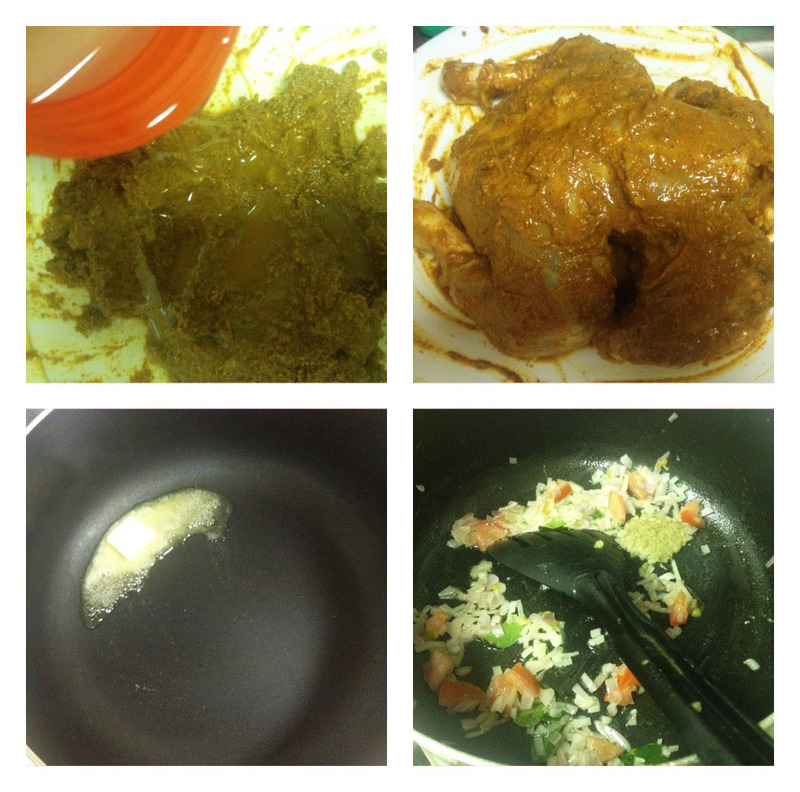 Thanks to Aarthi for such a delicious meal. Without marination and on the stove top instead of baking, it tastes outstanding. My husband and kids really enjoyed this whole chicken roast. Really it surprised me!!!. Because of the lack of time i just marinate it and immediately put on the flame. But the marinade still enters each and every part of the chicken. The best thing about this dish is that you will scramble for more till the chicken is licked to its bones. And when speaking about the plating....i should say that plating of a whole chicken will make us a feel to crave more than the chicken pieces of it. And I must say that the chicken is super moist, healthy since i did not use the skin and roasted in minimal oil only. 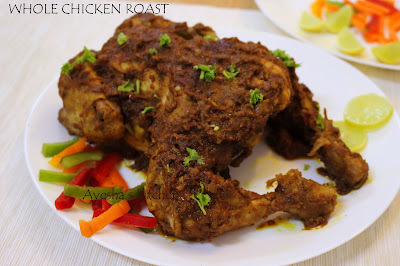 Definitely a fantastic whole chicken recipe which tastes amazing with an interesting flavor with very less time-consuming recipe. Do try it for yourself and am sure you will love it. Here is the recipe showing how to make a whole chicken roast. Clean well the whole chicken and pat dry. And with a knife poke holes all over the chicken. 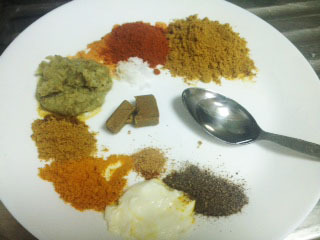 Now take chili powder, turmeric powder, coriander powder, garam masala powder, pepper powder, ginger garlic fennel seed paste, fenugreek powder, chicken cube, curd , vinegar and salt in a bowl. Mix all these ingredients well without adding water. Then add 1 tbsp oil to this marinade and mix well. Marinate the chicken well with this marinade. Let the remaining marinade set aside. Now heat butter in a big non stick vessel. When hot, saute the finely chopped onion well and when done add chopped tomato, curry leaves and salt. Saute for a while and then place the marinated whole chicken over the onion tomato gravy. Toss the chicken for 2 minutes on both sides. Now add the remaining marinade along with half a cup of warm water and make the flame medium low. Close the lid and let it cook for 5 minutes until the gravy starts to boil. 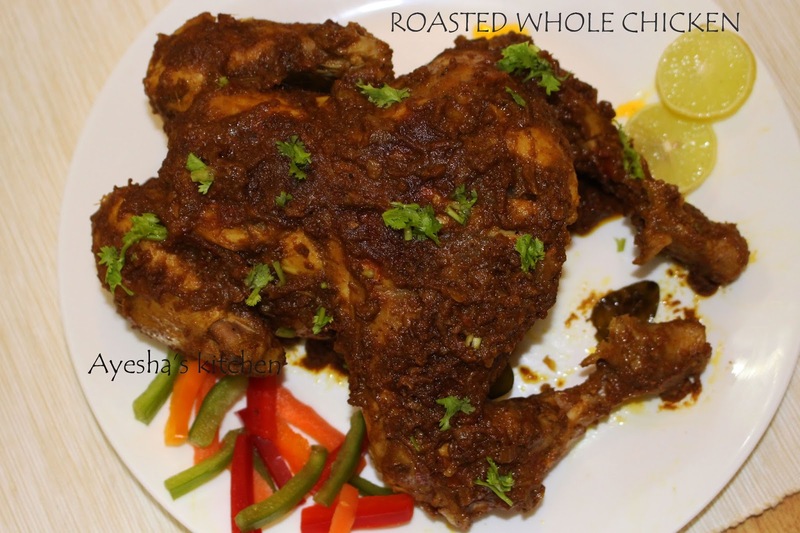 Cook on medium flame until the gravy dries out completely and the whole chicken is well coated with the masala. It will take around 20 - 30 minutes. Slow cooking gives the real taste and flavor to the chicken with super moist texture. Finally, when done, add 1 tbsp of coconut oil to the gravy and toss on high flame both the sides. Serve hot and decorate with chopped cilantro.